The City is now accepting applications for its Senior Home Improvement Grant program. Qualified applicants can receive up to $5,000 for home repairs that address code violations, substandard conditions, and necessary health and safety improvements. 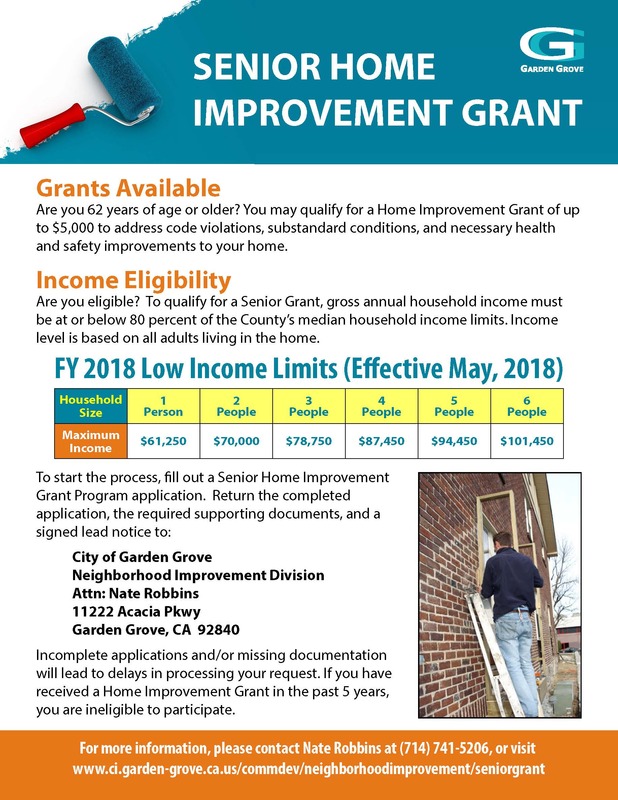 To apply, visit the Senior Home Improvement Grant webpage. To qualify, applicants must be 62 years of age or older, a Garden Grove homeowner, and have a gross annual household income that is at, or below, 80 percent of the County’s median household income limits. Income level is based on all adults living in the home. For more information about the Senior Home Improvement Grant program, contact Senior Program Specialist Nate Robbins at (714) 741-5206.